Skooter was Skippers friend. She only was made in two versions; #1040 Straight-leg and #1120 Bend-leg Skooter. 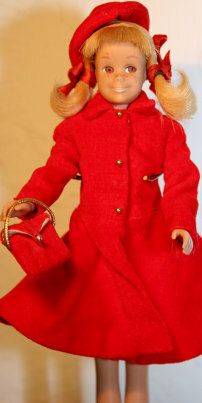 The later version dolls had a more pink tone skin color. 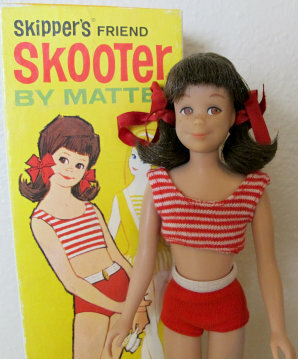 The straight-leg doll came in a red two-piece swim suit and the bendable version came in jean shorts and a polka-dot red and white top. She has brown eyes, and either blonde, brunette, or titian hair colors.